Plant extract: Pyrethrum | Infonet Biovision Home. Pyrethrum is a natural insecticide derived from 100% African Chrysanthemum cinerariaefolium flowers, but also in C. coccineum and C. marshalli flowers (members of the daisy or aster family). They are perennial plants with a daisy-like appearance and white flowers. The flowers possess insecticidal properties. Pyrethrum has been used for centuries as an insecticide and as a lice remedy. Because it decomposes rapidly in the environment, pyrethrum has been approved for a wide range of indoor and outdoor uses, including homes, restaurants, broad-scale spraying operations, and organic farms. Since it is considered non-synthetic, pyrethrum is allowed in some countries for organic home gardens. Preventive, cultural, mechanical and physical methods must be first choice for pest control, and conditions for use of a biological or botanical material must be documented in the organic system plan. 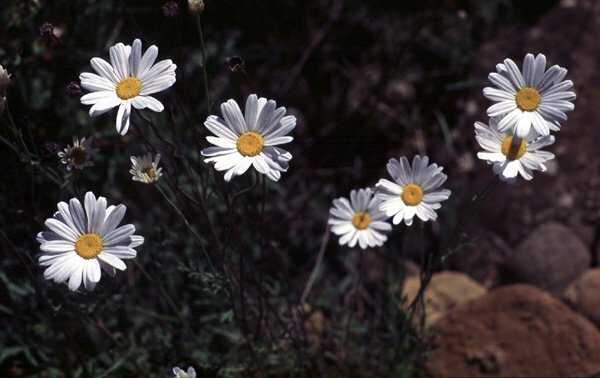 Pyrethrum is most productive at altitudes of above 1600 metres and ideally in semi-arid conditions where the winter is cool. On richer soils the insecticidal properties are reduced. The content of the active substances increases with altitude and cooler average temperatures. You will often find pyrethrum mixed with a synergist such as piperonyl butoxide (PBO). PBO gives pyrethrum an added "kick" that makes it more effective against insects. Products containing PBO are not approved for organic production. Pyrethrum is sometimes available blended with rotenone to increase the range of pests controlled (i.e. flea beetles) and perhaps efficacy. However, mixing insecticides against a specific target insect is not recommended because it will promote the development of resistance. Currently, none of these mixtures is approved for organic-farming. Liquid formulations typically contain 0.1-6% pyrethrum and up to 60% PBO (not permitted in organic culture); dusts contain 0.2-0.4% pyrethrum. Care should be taken not to mix pyrethrum with lime, sulphur, or soap solutions, since pyrethrum is broken down by both acid and alkaline conditions. Pyrethrum is rapidly broken down by sunlight. Use of UV-inhibiting adjuvants may allow for a longer period of control. Growers should decide whether the advantage of having a longer activity period for pyrethrum to protect the crop from reinfestations is appropriate for their management system, or would be a concern for its negative impact on beneficial species. Since pyrethrum is a contact poison the target pest must be present and hit by the spray. Flying insects such as cucumber beetle should be sprayed early in the morning when they are sluggish and bee pollinators are not present. Pyrethrins are the six constituent compounds with insecticidal properties that occur in these Chrysanthemum species. The pyrethrum daisy is native to southwest Asia. Kenya is the leading producer of pyrethrum followed by Australia. In Kenya, the active ingredients from the pyrethrum plants, are commercially available in most places under different commercial names such as "Flower-DS(r)". They are broad spectrum insect nerve poisons approved for controlling pests on flowers, fruits and vegetables in the garden and greenhouse. They can be used to control most aphids, cabbage loopers, leafhoppers, spider mites, stink bugs, thrips and whiteflies. Pyrethrins are effective in controlling weevil and normally recommended, but not accepted if sales are planned under organic systems. Py-Mack, is a by-product of the pyrethrin manufacturing industry, and is used as cattle feed. Most of the pyrethrins have been extracted, but enough remains that py-mack can be used as cutworm bait, and in treating early attacks of maize stalkborer. Feeding livestock py-mack is also said to reduce incidence of intestinal worms. Older studies: Pyrethrum is a broad-spectrum insecticide used to control true bugs, caterpillars, beetles, aphids, flies, mites, whiteflies, thrips and leafhoppers (Casida, 1973). Within these groups, pests may have a greater or lesser susceptibility to pyrethrum products. Specific pest species controlled by pyrethrum as noted in the older literature include potato leafhopper, beet leafhopper, cabbage looper, celery leaf tier, Say's stink bug, twelve-spotted cucumber beetle, six-spotted leafhopper, lygus bugs on peaches, grape thrips, flower thrips, grape leafhopper, and cranberry fruitworm. It was not considered particularly effective against flea beetles, imported cabbageworm, diamondback moth, aphids on spinach or lygus bugs on alfalfa (Casida 1973). Recent studies: A summary of recent university field trials of pyrethrum products on vegetable crops commonly grown in the Northeast USA was compiled. These university-based trials typically tested products with untreated buffer rows and other conditions that create unusually severe pest pressure. The level of pest control is likely to be higher on fields in which a good program of cultural controls has been implemented. Note: In contrary to the above mentioned natural extracts, pyrethroids are of the worst and most persistent pesticides! Pyrethroids are synthetic compounds whose structure and mode of action are similar to pyrethrins but they are not approved for use in organic production. There are many pyrethroids e.g. Ambush(r), Ammo(r), Aztec(r), Pounce(r) and Warrior (r). 1. Pick the flowers on a warm day when they are fully open. Select healthy, non-mouldy pyrethrum flowers. 2. Pile them up into small heaps in the sun to warm. Then spread out to dry on thick mats in a shady area. 3. If they are to be stored for future usage, make sure that they are properly dried and are stored in an airy container (never use plastic container), away from direct sunlight and moisture. Light breaks down the active ingredients of the flowers, reducing effectiveness. 4. Make sure that flowers are free from moulds before using them. 5. Do not store pyrethrum for long periods. The active ingredients in pyrethrum flowers break down with time. Farmers get the best price for pyrethrum at the factory gate if delivered within 3 months of harvesting. After that, the active ingredients start breaking down. A 6 month old dried flower may only have half the amount of active ingredients compared to a freshly dried flower. 6. Use utensils for the extract preparation that are not used for your food preparation and for drinking and cooking water containers. Clean properly all the utensils every time after using them. 7. Avoid direct contact with the crude extract while in the process of the preparation and during the application. 8. Make sure that you place the plant extract out of reach of children and house pets when leaving it overnight. 9. Harvest all the mature and ripe fruits of the crops to be sprayed before treating with pyrethrum. 10. Always test the plant extract formulation on a few infested plants first before going into large scale spraying. 11. When adding soap as an emulsifier, use a potash-based one. Liquid dish soap is easier to use. 12. Wear protective clothing while applying the extract. 13. Wash your hands after handling the plant extract. 14. Observe withholding period. Pyrethrum and pyrethrins has a 1 day withholding period, as the active ingredients break down quickly in sunlight. Pyrethrin and pyrethrum insecticides are mildly to toxic to mammals. Prolonged contact with the skin can produce a rash, and inhaling dust or spray can cause headaches and sickness.If you suffer from hay fever, avoid contact with pyrethrum flowers or py-mack. Some people have allergic reactions to them. Pyrethrins and related products tend to work best at lower temperatures and cloudy conditions. The efficacy is reduced when sprayed at midday on a hot day. Pyrethrin and pyrethrum insecticides will kill natural enemies including lady beetles, but do not appear to be harmful to bees. Though the effect of pyrethrum is as a nerve poison, the insects can sometimes recover from the amounts required to produce a knock down effect within 24 hours (especially if the extract is made from slightly older flowers). Close observation is required to ensure complete death of the targeted pests. If they recover, it means a higher concentration is needed. Pyrethrum is used in two ways: as a powder or dust and as a spray. Grind flowers to a dust. Use pure or mix with a carrier like talc, lime or diatomaceous earth (DE). Sprinkle over infested plants. Py-mack can be used in a similar manner. 1. Mix 20 g pyrethrum powder with 10 litres water. Soap can be added to make the substance more effective but it is not vital. Strain and apply immediately as a spray. For best effects this should be applied in the evening. 2. The active ingredients can also be extracted by alcohol. Mix one cup powdered pyrethrum flowers with1/8 cup of isopropyl alcohol (the blue alcohol used in house cleaning) or kerosene. Cover the container and let it sit overnight. Strain through a clean cotton cloth, then store the extract in a tightly sealed and a labelled container. When you need to use it, add 3 litres of water to the extract and spray. 3. Dofour preparation (for large scale spraying): 1 to 1.5 kg dried pyrethrum is mixed into 100 litres of water and 3 litres of liquid dish soap. Strain and spray. The addition of soap is supposed to increase the efficacy four-fold. Casida, J. E., (Ed.) (1973). Pyrethrum, The Natural Insecticide. Academic Press, New York. Cox, C. (2002). Pyrethrins/Pyrethrum Insecticide Factsheet. Journal of Pesticide Reform 22(1) 14-20.